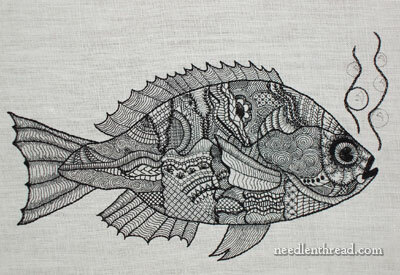 You’d think I’d be finished with the blackwork fish. After all, it’s only the bubbles that need doing, right??! And how hard can it be to stitch bubbles? It’s not so much that it’s difficult to stitch the bubbles. It’s just that I started stitching them, and now I’m not sure about them. And with hesitation came a complete halt in stitching. So I thought I’d show you where I am, so you can see exactly what I see, and then ask you if you can figure out what troubles me about the bubbles. Would anything trouble you about them? Or make you pause and wonder if you should change something? Or would you say, “Just leave it, plow ahead, and get it finished already! Sheeeeesh!”? September 8, 2010 Blackwork Fish Fin-ished. Hmmm…there is something about them. For me, I think of bubbles as completely independent and free floating. I’m not sure what the squiggly lines represent, movement of the water perhaps? What if you change the stitch of the bubble to something other than a chain stitch…that would help to give definition to each bubble. Perhaps a wrapped back stitch? He’s lovely, don’t think I would have had the imagination to come up with all of the different textures and stitches. I think the continuous chain stitch weighs down the bubbles, I would take it out use tiny single strand thread outline stitch and let those bubbles float free. But whenever I hesitate I usually end up taking it out and starting again. Can’t wait to see how you showcase him on your bag. perhaps you should separate the bubbles from their leader line by a fraction of an inch – as it is, it looks a little like a loopy string – not in keeping with the stunning fish! I would leave out the lines between the bubbles. I think I would stitch the bubbles themselves in a different stitch than their vertical paths..maybe a thinner stitch like stem stitch? What do you think? Mary, I can’t see that there is anything wrong with the bubbles. They look like bubbles. They look amazing. They look like they may burst if you don’t just get them done! So… take a deep breath and stitch them in already. I kinda like the way the spirals on the gill area look. Could you add that inside? I agree with Cyndi: they should be delicate! And smooth, too. Bubbles are such fragile things, and the chain stitch makes them rough and solid. I agree that the wavy lines don’t help. I read them as indicating a fish that is suffering from overheating. But that’s just my opinion and I can’t explain my perception. Have you cropped the photo; is there more space on that canvas? Even if you take out the wavy lines, the bubbles are a little crowded in the space they’re in. Would just two or three, all in a line and not too close to the edge, work? I agree with everyone else who suggested leaving out the squiggly lines. It looks like a fishing line. I would go with only the bubbles and delicate, small stitches around the bubbles. My two cents. As some others have said, I think a lighter weight thread and a thinner stitch, to replace the chain stitch, would give the bubbles a softer appearance. Bubbles are almost transparent, so I can see why they look too dark and heavy to you now. Methinks we all seem to be thinking alike…. and the “suffering from overheating” is pretty much what I was thinking! That made me laugh! It looks like heat waves or smoke…. a smoking fish. Smoked Fish. Maybe I’ll title the piece “Dinner”! Now, the question is, how to solve the problem. The markings are done with a permanent pen. I liked them, drawn on. Stitched is another question indeed! If you can’t take out the lines, maybe add some seaweed there, with the bubbles trapped among the tendrils? I think maybe an outline stitch instead of the chain. The chain looks too heavy for bubbles/current in water. The chain stitch is way too heavy for something as delicate as bubbles. I would also leave the wavy lines out — but seeing as how you can’t because they were marked with permanent marker, why not stitch them in white (or off-white, whichever the ground fabric is)? And then do the bubbles in either a very light single-strand outline stitch, or else in grey? If you can remove the wavy lines and bubbles cleanly, then I would move up some and just scatter an uneven number of bubbles higher up and without the wavy lines. That fish is to die for. I’m not sure the bubbles need to be attached to each other with the wavy lines. I think if you keep the line, it should be much thinner; stitched in your thinnest thread in stem stitch or back stitch. As it sits right now, it reminds me of the cartooning lines affectionately called “waftaromes” that indicate something stinky. What bothers me about the bubbles is the connection line. I don’t think they should look like they are attached to each other. Personally I would emphasize the bubbles more than the waves. Outline them with a chain stitch and the waves with line stitches. Can’t wait to see the finished project!!! I think that they should be there but they are just too heavy … I would suggest using a very fine thread which just covers your markings. All I can say is they need to be “whispy” ! I agree with what many have said. I would have removed the wavy lines totally but since they are drawn on with permanent marker I would make them as light weight as possible. I stem stitch done with a single ply of fiber perhaps. Permanent. That does make it challenging. I do agree with all the previous posts–it is the lines that are too heavy. Permanent pen. Hmmmmmm. Well, if you liked them drawn on, what if you used a very fine silk thread and made a very long stem stitch or back stitch just to cover the ink? The fish is wonderful. The bubbles need to be away from the line, I think. If you whipped the chain stitch to make it thinner and then used a very fine thread in stem stitch for the bubbles this might give you the effect you want. Okay, I’ll add my two cents’ worth, even though it has already been said. The bubbles are way too solid and substantial. They need to be etheral, like one strand of the most delicate stuff you have. And you have to keep those tiny little trianges of light reflection inside, but keep them teeny-tiny delicate too. Do you have any spider web thread?!! At first I thought the wavy lines were seaweed!! Anyway, it they are meant to indicate the motion of the water, they need to be much more delicate too, and bubbles should be separated from them. If one or two touch that should be okay. But lose the chain stitch!! I love “bubbles”. I like the bubbles and like the others commenting would probably forget the lines. How can I get this pattern? I learned to embroider when I was about 12 yrs old. Haven’t done it in many years. I’m retired now and am inspired by the website and patterns. I am eager to get started! I agree with many of the other comments. I think the two lines with the bubbles are not needed. I agree with the comment that the bubbles don’t appear delicate with such a thick line around them. I think if the line and inner design was of a thinner thread it would make them look “lighter” and more “delicate”. My vote would be to use a much thinner thread for the lines and/or a less heavy stitch than the chain. I think the lines depict movement of the bubbles and because of that I would make them very fine. Perhaps a straight stitch and then switch to the chain for the bubble itself? Permanent marker…rats! I like Kelly’s idea of seaweed with bubbles. Delicate seaweed though! If you can make a finer stitch over the lines, that would help a lot! Seaweed or even something that looks like coral. Can’t wait to see it finished! HI Mary, if it were me stitichingthe fish, I would use back stitch (maybe even split back stitch) or Holbein stitch for the lines and around the outside of the bubbles and around the outside of the higlight and to also to create a pattern inside the bubble, but leave the highlight empty! I think maybe the line is too thick. Bubbles are usually clear, so I think making them less prominant with thinner lines????? How about doing the bubbles in black, and using an iridescent filament to do the wavy lines? 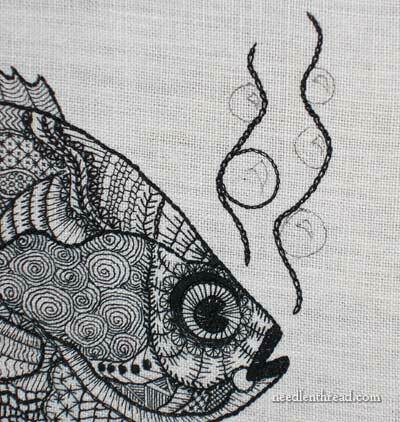 I’d go for stem stitch for the wavy lines so that it lessens them compared to the bubbles. Well I for one love every thing about it! It’s looking great! And I must say thank you for all of the information here. I am a noob when it comes to embroidery, and this site has been a God-send. I think the bubbles need to appear more sunstantial than the wavy lines and would suggest doing the bubbles in a heavier thread and stitch. I think the wavy lines are right compared to the fish as a whole. I’ve always loved those bubbly design lines. AnneG’s suggestion of the gill spirals appeals, but even moreso the fine fin lines I think, following the lower curve of the highlight. The same line outlining the highlight, leaving the inside blank. Could the water movement lines be a similar fine line but here and there make it double. Not neccessarily thicker, but two separate lines with a tiny space between them. Do you think it would be over done if a third line was placed between the two already there? Just parts of a fine background line without bubbles. Perhaps starting and finishing just below the big bubble, starting again a bit above it like as if it goes behind the bubble. It could then either start again beyond the top left hand bubble OR meander a little up the centre. Thinking it may give the other lines more definition that they’re independant of the bubbles. I’d have to agree with the others that the bubbles and connecting lines need to be thinner. I’d probably use good old stem stitch in a thin thread. Chain stitch just looks to heavy for water in this piece (no pun intended). I think I’d keep the lines along with the bubbles, but I’d make the lines of a very light stitch (I like the idea of the random running stitch) since they show water movement, and another equally delicate stitch for the bubbles. I don’t think the bubbles need to be separated from the lines as they are making the lines with their upward movement. Since the fish is the focal point, the bubbles are simply accents of his/her expelling air. You’ve done a magnificent and creative piece! I’d be framing it and putting a light over it. that it is pretty fragile. You have apiece of art and using it in a functional piece is going to cause great wear. Give some thought as to how it could be preserved. I love it.